The OFFICIAL Gothikah Youtube channel is !!!ONLINE!!! !! !Please go SUBSCRIBE now at GothikahLIVE!!! 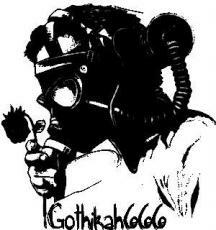 The Gothikah666 OFFICIAL Facebook, Twitter, !!!AND!!! Youtube page is a GREAT way to get in touch with your favorite poet/writer, ask any and all questions, connect with other fans, get access to EXCLUSIVE writing, and maybe give you some cool stuff to think about too. So go on, check it out and "Like" me on Facebook and "Follow" me on Twitter !!!NOW!!! Gothikah666...A name that means much more to me than just a name. It means an identity that I am proud to wear. It means when I take on the name there isn't anything I have to hold in anymore. Its not just a name to me, its like a whole new life created from scratch. I write my poetry as Gothikah, everytime I'm depressed and I need to get away I'm Gothikah, and when I am explaining my theories on this beautifully horrid world we live in I AM GOTHIKAH. Something that once started as just a name has flourished into a life I started to live and a person I finally let free. See, Gothikah represents the unholy and cruel truths and the untouched emotional republic we all have neglected and shunned. I also realize all the things I'm saying about him....I also say about me, because well, he is me, but when it comes down to it, I'm more him than I am myself...and you know what?....I'm damn proud of it. So while we all sit at these computer screens with our names we have created and people we make out of thin air, truly take the time to actually appreciate the person you have put yourself in...Because I know I do. Gothikah is who I am, there is no act, no playing around, no jokes. What I write is who I am and its all real. HOPE YOU ENJOY ME, MY WORK, MY MUSIC, AND MY PAGE. BY THE WAY IF YOU HAVEN'T BY NOW HEAD UP TO THE TOP OF THE PAGE AND FAN ME ALREADY THEN HEAD OVER TO MY FACEBOOK AND CLICK ON THAT "LIKE" BUTTON OR GO FOLLOW ME ON TWITTER!! !